When it comes to buying swimsuits, it’s usually a challenge. My ego wants me to order online so I don’t have to try anything on in the store….but the logical person in me wants to try it on in the store so I know immediately if it fits or not and if it looks good. Add to it the fact that I will probably grab 4 of each suit because I have no idea what size I will need in a particular suit (is it true to size, does it run big, or is it super tiny)? So a few days ago I went to Everything But Water the largest specialty retailer of swim, resort wear and accessories in the US. And, I went with two kids in tow…the two that have helped me with some “troubling” swimsuit areas. Now, you all know I’m far from a fashionista, but when I walked up to the store, I was definitely intrigued (and felt only slightly out of my element!) But the ladies there made me feel right at home. The store had many brands and styles of swimsuits as well as colorful options. When I first heard of the store I was worried it was going to be tiny swimsuits that only fit size 2 women. I couldn’t have been more wrong. There were options for all body types and sizes. The most impressive and amazing part? They had looked at my blog and pictures, and pulled all of these suits in all of the right sizes without talking to me once. Talk about customer service! They were all waiting in a fitting room for me. I don’t think anybody has ever impressed me in a store like that. Every single one of these suits fit me! Now, they didn’t all fit perfectly or cover everything I wanted covered, but they all had potential. The ladies were awesome, too. They came to check and see how each suit fit and what was good and what was bad about it. We decided that I shouldn’t have a top that went straight across and needed a little more shape to it. Then, they helped with the right color and fit for just the right look that flattered me. The shopping experience was great, even with a 4 year old and a 9 month old with me. Even though the swimsuits were a little more expensive than what I’m used to, I would definitely get another one there. I was very happy with the way it fit and I know it will last a while, so for one swimsuit a year it was totally worth it. For over 20 years, Everything But Water has been sending women off in style believing that swim shopping should be a luxurious me-moment. Be it a tropical vacation or time by the pool, one can leave their shopping experience with their ultimate head-to-sandy-toe look, and feeling beautiful and confident for her next getaway. Known and beloved for its fit, their fashion-savvy sales associate’s help women find swimsuits, cover ups and accessories that feel amazing and look fabulous. Those who prefer to shop for resortwear online will find an unparalleled selection on the redesigned everythingbutwater.com where one can find videos and style stories that offer fashion inspiration and highlight top trends. Along with free shipping, the site offers a Perfect Fit guide to educate women on the most flattering designs for each body type. *Everything But Water provided me with a personal tour of the store as well as a thank you gift towards my purchase for my time. All thoughts are my own. I haven’t heard about them before. Thank you for the review! sounds like you worked with some nice ladies..that’s how I like to buy a suit too! 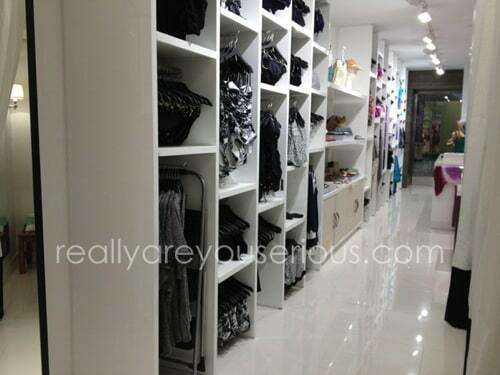 It looks like a great store..ours was really small, so this is quite impressive! I hope you found a good one! It really wasn’t a huge store, just arranged well so they could fit a lot! wow, great customer service. Makes the shopping experience even better. This can be so intimidating! I’ve seen the store before, but never went in. Maybe next summer I should…to acknowledge my recent weight loss.